Much information about the Police National Computer, some well-known, some less-so, can be found in the work of the Information Commissioner's Office and Information Tribunal. I am summarising below general information about the PNC obtained mostly from a July decision notice by the Information Commissioner about the National Police Improvement Agency (NPIA), from an older decision, from last year, by the Information Tribunal about five police forces, and from the NPIA (now the College of Policing). 27.—(4) The Secretary of State may by regulations make provision for recording in national police records convictions for such offences as are specified in the regulations. The Chief Constables or Officers of the 43 England and Wales police forces through their Association of Chief Police Officers (ACPO) pool much of their collective intelligence on the PNC. The PNC holds conviction data gathered from the Courts (which are often referred to as ‘hard data’) and other data such as arrests and charges (which are often referred to as ‘soft data’) provided by Chief Constables. The latter includes "Non convictions summary". The PNC also identifies whether DNA and finger prints are held on an individual. The technology used is old and is planned to be updated. In addition each force has a variety of systems where intelligence is held locally. Each of the 43 police forces in England and Wales can add information to the PNC, and can also delete information. Uses of information held on the PNC other than for operational policing purposes include providing assistance to the Crown Prosecution Service (CPS) (or any other prosecuting agency) in the prosecution of an offence, and the courts in the administration of justice; assisting organisations such as social services departments and probation services in multi-agency work to protect the public, in particular young and vulnerable persons; disclosure of information in the context of employment vetting to the CRB; and public safety and protection of life and property, for example assisting members of the public in discovering the whereabouts of missing persons. The Europen Courts of Human Rights explained that records on the PNC are not only accessible to the police, but also to 56 non-police bodies, including Government agencies and departments, private groups such as British Telecom and the Association of British Insurers, and even certain employers. Furthermore, the PNC is linked to the Europe-wide Schengen Information System. Names—these records are created when individuals are arrested. They record any charges and the subsequent disposal. All recordable convictions are held on the PNC. In England and Wales, records are retained in accordance with ACPO's Criminal Records Office PNC Data Retention Guidelines (publicly available via the ACRO website). In essence all records are retained until the individual is 100 years of age. Records from Scotland are retained in accordance with their legislation and records on the PNC are deleted in the same timeframe as that of Scotland's Criminal History System (CHS). Crimelink—these records are constructed by the police and relate to serious unsolved crimes, where the perpetrator has yet to be identified. Property—these records are constructed by the police and describe stolen, lost and found items of property that are uniquely identifiable by a (serial) number. Vehicles—these records are made up of the key data items held by the Driver and Vehicle Licensing Agency (DVLA) that describe the vehicle and its registered keeper. This information, supplemented by any police reports relating to vehicles of interest to the police, is primarily used for roads policing purposes. Drivers Licences—these records are made up of the key data items from DVLA and record driver entitlement. Their use is confined to roads policing. The system was constructed to enable enquiries to be carried out efficiently and save members of the public from having to present their documents at police stations, reducing inconvenience and saving police time. National Firearms Certificate Holders—these are records pertaining to the management of firearm licences. They hold details of members of the public who legally own firearms, renew firearms licences, have been refused a licence or had one revoked. The Dunblane tragedy was a key driver for developing the system. The PNC is a dynamic database which is constantly updated. According to the NPIA annual report and accounts 2008-09, the "PNC holds over 9.2 million nominal (people) records, 52 million driver records and 55 million vehicle records [and] PNC usage in the 12 months ending April 2009 was approximately 185 million transactions. However, according to information provided by the NPIA to the Information Commissioner in the past two years, there are "45,000,000 records on the PNC". Alan Campbell's figures in his written answer are close to those of the NPIA annual accounts. is the subject of judicial process for recordable offences. A record can also be created in relation to a person who is missing in certain circumstances or has otherwise come to notice. The PNC is an ADABAS (Adaptable Database System) management system. It does not use Structured Query Language (SQL) to search for information. Searches are carried out using ‘natural coded software’ using a QUEST (Querying Using Enhanced Search Techniques). A QUEST enables searches of the names database to identify suspects through the use of gathered information such as physical description and personal features. QUEST is not designed as a statistical tool; it is an operational tool used to identify offenders by inputting various descriptive parameters. The NPIA is able to run a QUEST to perform a tally of records within a set of given parameters. This function allows PNC operators to compare and contrast records within the descriptive parameters to define a search down to a reasonable number of responses. There is a display limit of 2000 responses for any tally. The PNC cannot be searched using free text fields. The PNC is capable of recording more than 300 data items against an individual, including the offence, its code and the date it occurred. (The written answer states that the Names database has 253 fields available and that where fields are sub-divided, this has been counted as one data field - so these two figures may be consistent and are anyway of the same order of magnitude). 3.—(1) There may be recorded in national police records—convictions for; and cautions, reprimands and warnings given in respect of, any offence punishable with imprisonment and any offence specified in the Schedule to these Regulations [see the post Recordable offences]. In paragraph (1) above—the reference to an offence punishable with imprisonment shall be construed without regard to any prohibition or restriction imposed by or under any enactment on the punishment of young offenders; “caution” has the same meaning as in Part V of the Police Act 1997; and “reprimand” and “warning” mean a reprimand or, as the case may be, a warning given under section 65 of the Crime and Disorder Act 1998. Where the conviction of any person is recordable in accordance with this regulation, there may also be recorded in national police records his conviction for any other offence of which he is convicted in the same proceedings. Changes to the codes for crimes on the PNC is the responsibility of the National Identification Service (NIS), a centrally funded organisation within the Metropolitan Police Operational Information Service. Information held in the PNC is subject to ‘weeding’ rules defined in the MoPI Guidance - Step model - Retention Guidelines. The information may be "stepped down", i.e. only open to inspection by the police, after defined time periods. The information may be deleted when a subject reaches 100-year old or when a case is considered "exceptional" enough. The legal framework is permissive, not mandatory. Certain conviction information may be recorded in national police records; there is no statutory obligation to record conviction information, and nor is there an obligation to retain conviction information (either for any particular period, or indefinitely) once it has been recorded. Nor is the legislative framework comprehensive. Certain legal offences are not liable to imprisonment and are not specified in the Schedule to the Regulations, and hence they are not recordable. For instance, it is understood that the offences created by the Data Protection Act itself are at present not recordable. Therefore even if all recordable offences were recorded and retained indefinitely, the PNC would not be a comprehensive record of all criminal convictions. The information held in the PNC is saved three times a week. Three ‘generations’ of data are kept at any given time. As a new generation of data is saved, the oldest generation is removed. The NPIA do not retain a ‘snap-shot’ of the data on the PNC for any particular time. The NPIA have an audit trail of changes made to the PNC which allows the contents to be recovered to its last iteration. Changes to PNC software and those at database level (not to be confused with updates to individual records made by police users) are recorded in hand over documents which are retained for approximately 3 years. At present, step down is a manual process. Where a record is stepped down from the PNC then conviction information is removed from the PNC, although a record of an individual’s name and other identifying information remains on the PNC. The individual’s record on the PNC would also include an indication that information has been stepped down. Information is held in paper records, not on computer, under the control of ACPO. It is intended that at some point in the future the step down process should operate automatically, not manually. What is envisaged is that stepped down information will be held on the PNC, but that special measures will be taken to ensure that it is only accessible to police users of the PNC. The NPIA maintains and delivers the PNC and acts as a central resource for police forces. The NPIA maintains the ‘hardware’ of the PNC. The NPIA does not determine policy in respect of the data recorded on the PNC. It is outside of the NPIA’s remit to dictate to police forces how data should be entered onto PNC; this is the responsibility of the Association of Chief Police Officers (ACPO). The NPIA produces national plans. This does not involve interrogating data held on the PNC. The NPIA use information from the PNC for the purpose of operational research, for and on behalf of police forces. Within the NPIA are a number of organisations such as the Missing Persons Bureau (MPB) and the Serious Crime Analysis Squad (SCAS). These use the PNC in limited ways for their specific functions; for instance, the SCAS uses PNC information to obtain intelligence on known offenders and on suspects for outstanding serious crimes. They do not input data into the PNC. The PNC recorded 7,625 transactions by the NPIA SCAS and MPB during 2008. Note that even though the NPIA argued "that it holds and is responsible for the PNC in its capacity as Data Processor and it is the individual police forces who are the Data Controllers", the Commissioner found in its recent decision notice that "Where information is held by a public authority, to any extent for its own purposes, then it holds that information otherwise than on behalf of information for the purposes of the Act." This means that, for instance, Freedom of Information requests about the PNC can be sent to the NPIA and not just to the police forces. These notes about the PNC are a mash up of several sources, and in some instances they highlight inconsistencies in the information available. There's no obvious explanation for the discrepancy in the number of records, especially as the conflicting figures originally came from the same organisation, the NPIA. On a more general level, there seems to be two different understandings for the "PNC": either a database of arrested individuals and crimes, or a more encompassing system made up of several databases. While the latter may be more accurate, the former seems to be closer to the general understanding as well as to the scope defined in PACE 1984. First published on 2009-08-29; last updated on 2014-10-08 (fixed dead links). Bootnote: The Library of the House of Commons published, on 2014-04-15, the Standard Note The retention and disclosure of criminal records. Friday marked the one year anniversary of the death of Sean Rigg. He died while in police custody after he was brought to Brixton police station where he was placed in a metal cage outside at the back of the station. 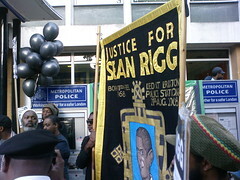 His family and the United campaign against police violence organised a rally followed by vigil outside Brixton police station to demand justice for Sean Rigg and for other deaths in police custody. Black men figure prominently among the death in custody, and Brixton police has been involved in too many of these. We walked from the street where Sean Rigg was living up to the Brixton police station. Families and friends of several men killed in police custody had joined the vigil and said a few words. 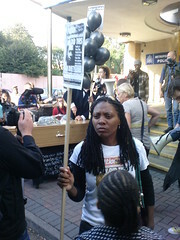 Jo Lang, a friend of Blair Peach who died 30 years after being hit on the head by a police officer at a demonstration, stressed the necessary unity of this campaign, "there are numerous more people who are killed in police custody but we never hear about them because there is no one speaking out for them. That is why it is so important we are here today." Thirty year later, the Cass report into the police actions on the day Blair Peach died has still not been released, though when it is eventually published Jo Lang expects it to be heavily redacted. Marcia Rigg-Samuel and Samantha Rigg-David explained what little they have managed to find out about the death of their brother, and the many failures of the IPCC. It may be years before an inquest in Sean Rigg's death happens. The evening concluded with the release of black balloons, some from a coffin, and lighting of candlelights. There were no cameras in the police van that took Rigg to the police station and the Independent Police Complaints Commission (IPCC), which is expected to complete its investigation next month, initially told Rigg's family that only CCTV footage seized from inside the station showed the cage where he died – and the cameras involved had limited views. Convinced there were more outdoor cameras nearby, Rigg's family demanded an audit of security cameras at the station. IPCC investigators then conceded there were more cameras overlooking the cage. But two weeks later, they said they had tried to obtain the tapes and found the recorders had not been working for three months. Rigg's family suspect a cover-up. The IPCC's claim about CCTV contradicts repeated assurances given to the family by a senior police officer two days after Rigg died. Suzanne Wallace, a chief inspector who was in charge of the station, was caught on tape saying CCTV was working and recordings had been seized. For Rigg's family, the missing CCTV footage raises serious questions about the actions of police on 21 August last year. They want to know why he was left for an hour in an outdoor cage, which functions as a station holding area, rather than taken into the custody suite. One theory held by the family is that officers knew the cage was in a CCTV "blind spot" and left Rigg there so there would be less evidence of his deteriorating condition upon arrival at the station. Another is that the tapes were destroyed during the 27 days it took the IPCC to attempt to seize footage from outdoor cameras. Rigg's sister Marcia, 45, said: "It is my opinion that this is a deliberate cover-up by the police, and the IPCC [by failing to rigorously investigate] are allowing that cover-up. It's all part of collusion and to me the IPCC are certainly not independent." Records show some cameras at Brixton police station were reported as faulty. However an annual maintenance check of all CCTV completed on 12 August, nine days before Rigg died, found no problems with the cameras that the family believe should have recorded Rigg's last moments alive. The van entered the police yard at 7.53pm and Rigg was left inside for about 10 minutes before officers escorted him to the cage. CCTV inside the station's custody area recorded obscured footage of Rigg in the cage. His family, who have watched the images, say they show him collapse repeatedly and lose consciousness. In the family's view, the IPCC has yet to give an adequate explanation about the missing CCTV. "That was the way we were going to find out what was going to happen that night," said Wayne Rigg. "We were told that the cameras were working. We went and saw the positions of these cameras. Then to be told the cameras weren't working – we were devastated." This follows a similar patter to what happened more recently when Ian Tomlinson died after being hit by police officers during the G20 demonstration, the story about the CCTV evolved from denial to possible existence. Unfortunately for the Rigg family there was no independent amateur footage available. Update: Fourmanfilms has posted a video filmed at the rally and vigil. First published on 2009-08-23; last updated on 2009-08-24. Until that time [when new guidelines are set by the Home Office], the current retention policy on fingerprints and DNA remains unchanged. Individuals who consider they fall within the ruling in the S and Marper case should await the full response to the ruling by the government prior to seeking advice and/or action from the police service in order to address their personal issue on the matter. Acpo strongly advise that decisions to remove records should not be based on [the government's] proposed changes. It is therefore vitally important that any applications for removals of records should be considered against current legislation. The Government is expected to provide a considered response to this ruling, which is currently under consideration by their Lawyers. Whilst this judgement has gone against the Government, it does not have any impact on the current retention fingerprint and DNA policy until the law is changed by Parliament. It therefore follows that the current legislation and procedures remain unaffected by this ruling. Individuals who consider that they fall within the ruling in the S & Marper case should await the full response to the ruling by Government prior to seeking advice and/or action from the Police Service in order to address their personal issues on the matter. Once the legal interpretation has been established, further advice will be provided via the ACPO Criminal Records Office. Last March, I wrote about how this advice is being followed by chief constables in Three months on, you still can't get off the DNA database. Read that article for typical letters from chief constables to individuals requesting to get off the NDNAD. Anecdotal evidence shows that chief constables have attempted to rebuff those writing to them to have their DNA samples destroyed, DNA profile deleted and other associated records (fingerprints, palm prints, PNC) deleted by responding along the lines of "Individuals who consider that they fall within the ruling in the S & Marper case are being advised to await the full response to the ruling by the Government prior to seeking advice and/or action from the Police Service in order to address their personal issues on the matter" (excerpt from such a response). This is of course not acceptable as until new laws and regulations are put in place, "applications for removals of records should be considered against current legislation" and regulations on their individual merit. The infamous Retention guidelines for nominal records of the police national computer describes the procedure to decide whether a case is deemed to be exceptional enough for the request to be granted. These guidelines are issued by the Association of Chief of Police Officers (ACPO), a private company. If your DNA profile is on the NDNAD do apply to get off it. Few have done it. Combined figures for 2008 obtained from 20 police forces that did record this information show that out of 535 requests received, 211 succeeded. You will need to persevere and don't take no as an answer. As shown by Damian Green who just announced his DNA profile has been removed, it is possible to successfully argue one's case is exceptional. (Ironically, he was commenting on the "draconian" retention guidelines only a few days before his arrest and DNA sampling last November.) However, being an MP may have helped him. Dr Helen Wallace from GeneWatch UK said: "We congratulate Damian Green on his success but it highlights how arbitrary and unfair the system is. People who are famous or get press coverage for their case seem to get removed while the vast majority of people do not." For the vast majority, there's help in the form of a website launched earlier this year by a coalition of NGOs, including GeneWatch UK: ReclaimYourDNA. DNA samples can be taken from anyone arrested for a recordable offence. The list of such offences has evolved with several statutory instruments (SIs) amending previous legislation and can be difficult to figure out. This post aims to remedy this! 54. Persistent begging (section 4 of the Vagrancy Act 1824). For more information on a specific offence, check out the law mentioned in brackets in the UK Statute Law Database (very good search facility and the laws integrate some revisions from later amendments - unfortunately not fully up-to-date for many laws) or the Office of Public Sector Information (the original legislation as it was enacted). With close to 8% of the UK population on the National DNA Database (NDNAD), you must know someone whose DNA profile is on it. Finding out how to get off it and attempting to engage in a proper debate about its future I found the Home Office wasn’t listening but NGOs were really helpful. Stigma: you might object to the presumption that you will offend and be adjudged as an “honorary” criminal. Privacy: DNA is a most intimate biological data and no one else should own such essential element of your personal identity. Database state: this criminal intelligence database can be accessed when it shouldn’t, your data can be lost or used for research without your consent. Seeking deletion of your DNA profile from the database (and destruction of the DNA sample) is an arcane process. It took me much searching of Home Office and Police documents to understand how this works. Not even MPs debating an NDNAD related amendment at the end of 2008 were fully aware of the process! Few have done it. Combined figures for 2008 obtained from 20 police forces that did record this information show that out of 535 requests received, 211 succeeded. The Chief Constable of the force that arrested you owns your DNA and, once asked, will relent to delete it only in exceptional cases. The Chief Constable may have a different opinion from you of what is exceptional. Being among the 350,000 to a million innocents on the database (the exact number is not known as not all profiles are reconciled with the Police National Computer) helps. Earlier this year, a coalition of NGOs addressed this issue by launching the ReclaimYourDNA website. Following the European Court of Human Rights ruling against the UK, the Home Office eventually published a consultation: Keeping the right people on the DNA database (closing tomorrow). It’s a rushed job. The included research was described as “possibly the most unclear and badly presented piece of research I have ever seen in a professional environment” by Ben Goldacre. I contacted its author but got no reply. I asked the Home Office for its correspondence about it, but that was exempted. Eventually I sought the statistics used by the Home Office in creating the consultation and was told that they may respond after the consultation closes. The consultation documents are flawed in other ways. For instance, the chief economist was given an earlier draft to review, with different options, and the costing for removing DNA wrongly assumes each removal has to be individually reviewed. I wrote to the Home Office consultation co-ordinator to complain but he does not find any problem with the consultation documents. Attempts to engage with the Home Office to obtain valid data and a corrected up-to-date version of its plans were all frustrated. Time again, NGOs came to the rescue to help make sense of these confusing documents. I attended a briefing for the children’s sector organised by ARCH and GeneWatch UK, and a seminar for Britain’s black communities held by Black Mental Health and GeneWatch UK. Alan Brown, Head of Police Powers and Procedures, Home Office, was a guest speaker at the seminar. Consultation responses are to be sent to him, so I was looking forward to get some clarifications. About the plans to retain DNA of innocents for six or 12 years, he offered: “More than happy to take constructive criticism. Indicate why you think it’s wrong. But we do feel we need retention whether it’s one or 15 years.” However he promptly left the building after only a few questions missing an opportunity to participate in the panel discussion and engage directly with a community over-represented in the NDNAD. Where the Home Office brings confusion and pretends to be open to constructive criticism, small NGOs are doing an impressive work of public education and engagement. You have one day left to respond to the Home Office consultation. If you need help answering it, GeneWatch UK has published a briefing document (doc).